Published quarterly in print & digital formats, Think Sales Magazine is the go-to handbook for high-impact sales management leaders. Every issue is designed to equip sales leaders with strategic knowledge, tactical skills and leading-edge management insights necessary to lead sales organisations to achieve results. ThinkSales Magazine is distributed to select CNA and Exclusive Books outlets and is available at premium airport lounges. ThinkSales Magazine received international recognition at the TABBIE Awards in 2018, 2015 and 2014, when it was selected from over 500 entries from across the globe and placed in the Top 25 for ‘Best Single Issue’. Subscribe to ThinkSales Magazine via the digital newsstand Magzter to receive and read issues on your PC, tablet or smartphone. Print subscriptions are available for bulk orders with delivery to a single address in South Africa. See the FAQs below for more info. 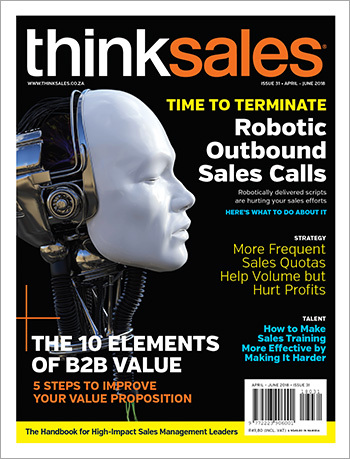 Where can I buy a printed version of ThinkSales Magazine? Magzter is the world’s largest and fastest growing cross platform global digital magazine newsstand. Readers can browse; preview and purchase magazines of their choice with a single touch and read it on up to 5 of their chosen smart devices. How do I read my digital ThinkSales Magazine issues online via Magzter? How do I download a digital issue to read it offline on my phone or tablet? You can download magazines from the app onto your smart devices. Please make sure you have the latest version of the application installed on your device. The application is designed in such a way that once the magazine is completely downloaded, you will be able to read it even when offline till you delete it. The ‘Remove’ button in the ‘On My Device’ tab is used to delete the downloaded magazines from your device. If you remove a magazine from that list, then you will have to re-download it again. Even when you are offline, you should see the ‘Read Now’ button for magazines that you have downloaded completely. How do I know when new digital issues of the magazine that I've subscribed to, become available? Whenever new issues of the magazines that you’ve subscribed to become available, we will notify you via emails and push notifications. Go to your iPad/iPhone settings by touching the Settings icon on your iPad/iPhone’s display. This is the icon that looks like a gear. This will take you to a screen with a list of settings on the left side. Select Notifications (which is just under the Wi-Fi settings). Once you choose the Notifications setting, you can turn ON push notifications by touching the radio button. You can flip notifications from ON back to OFF by touching the radio button again. Do you offer individual print subscriptions? Unfortunately we no longer offer individual print subscriptions. We found that too many of our subscribers were not receiving their issues, or were receiving them late. We had used the Post Office and private delivery companies but were unable to find a reliable supplier that was able to provide consistent delivery. Do you offer bulk print subscriptions? Yes, we offer Bulk Subscriptions for a minimum of 50 subscriptions, for a period of one year (4 issues published per year). These magazines are delivered by courier to one address within the Republic of South Africa.